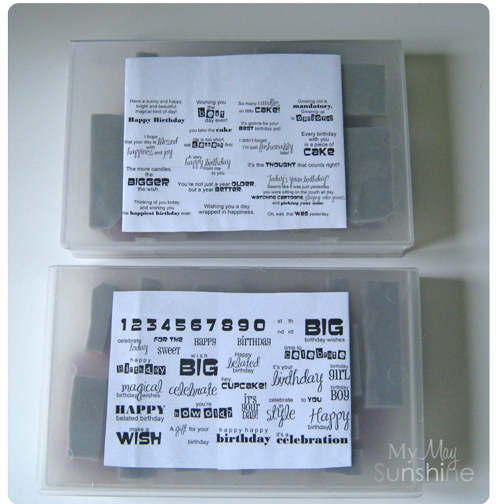 When it comes to organising stamps, there are plenty of different ways to store stamps. I knew that I needed a way that wouldn’t take up much room and would fit neatly on a shelf. 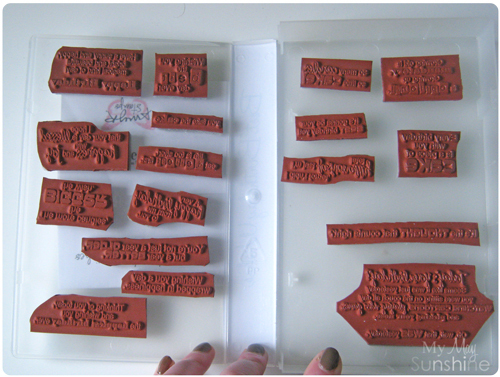 I mainly have clear stamps and only 2 sets of rubber stamps, so the main priority was to store the clear stamps. 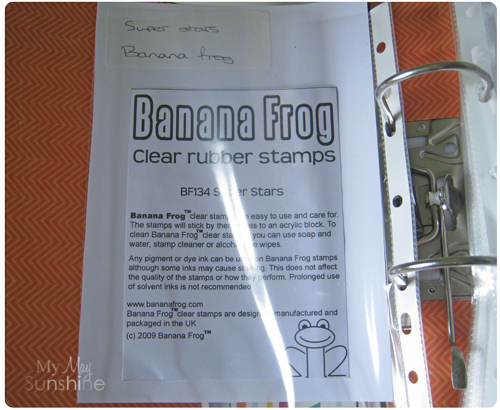 I chose to use A5 ring binders for the clear stamps. 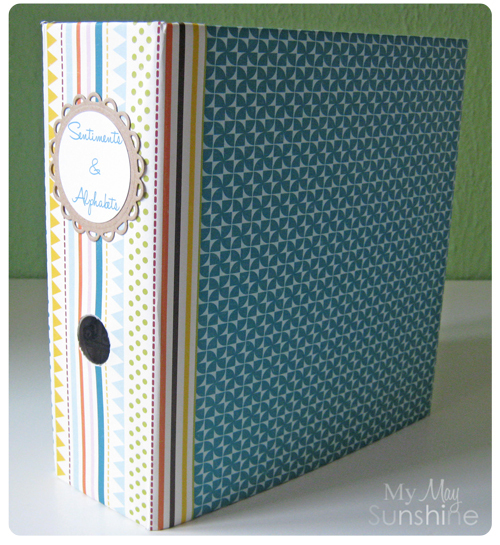 I have 1 binder for sentiments and alphabets and 1 for image stamps. 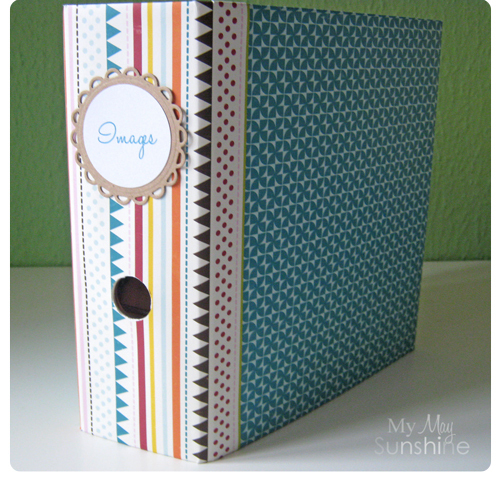 The binders were boring black so I decided to jazz them up using Echo Parks A Walk In The Park papers and then added a label to the side using a Spellbinders Nestabilities lacey circle die and creating a label on my computer to put on top of it. 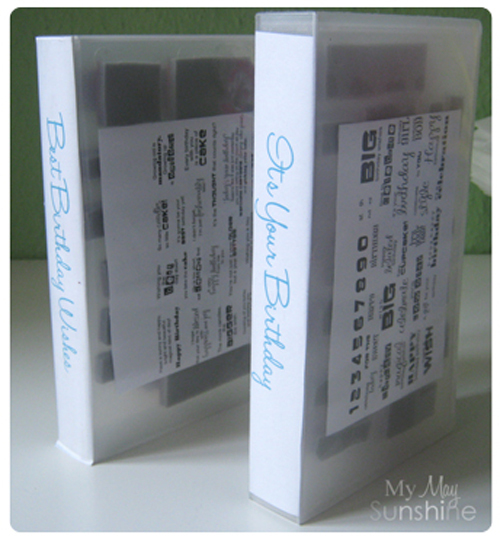 To store the stamps inside the binders, I used some A5 plastic pockets. 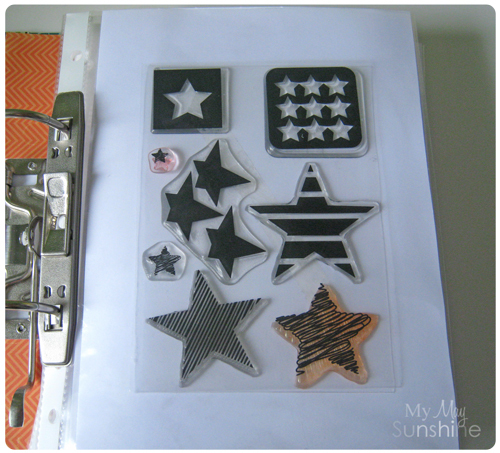 I stuck the stamps to some card and added a label on the back of the card with the name of the stamp set. 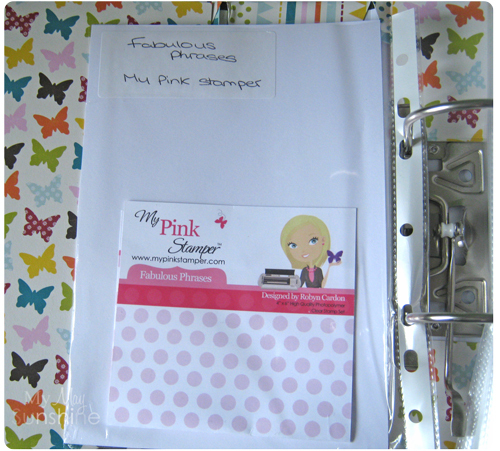 The ring binders are a simple way to store stamps and keep them neat and organised. 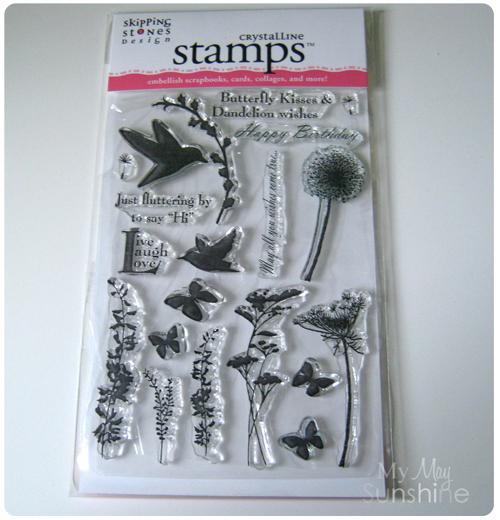 These stamps have yet to be added to the binders as I have only just received them from Skipping Stones Designs. I won them in the sketch challenge 114 that I entered this card. I am looking forward to using them. 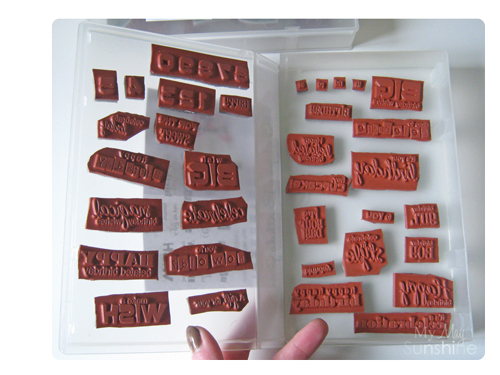 So, when it came to storing the rubber stamps, I wasn’t sure how I could store them. I saw that people were storing them in DVD style cases and some stamps come in them. I thought I would try using old video cassette cases. I managed to dig out 2 cases for my 2 Amy R stamp sets and they fit quite well in them. 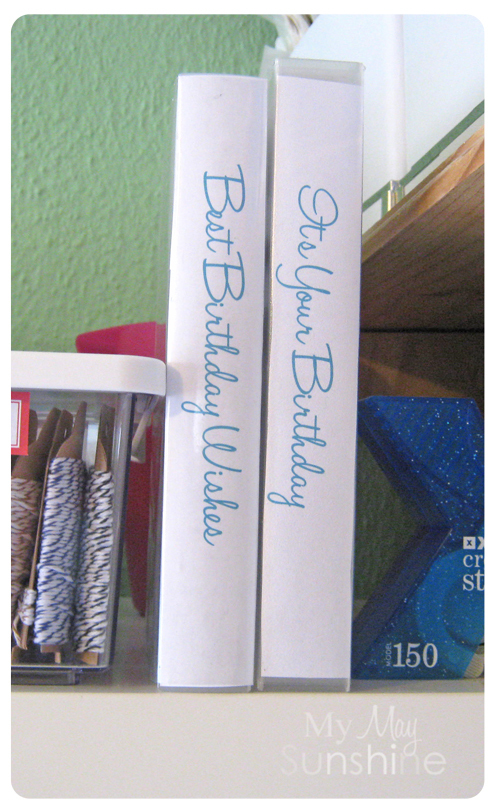 They sit neatly on the shelf and I just printed off some labels, for the side of the cases, using Microsoft Word. So those are the ways I store my stamps, how do you store yours? Such a good idea! Thanks for giving me the will to tidy up my craft/stamp box! I heart this so much. The organization is amazing! If you can, I hope you share this at my new link party. Such a great idea! and the binders are too cute! What a great way to Organize everything! Great space-saving idea for the stamps! And the binders are extremely cute! 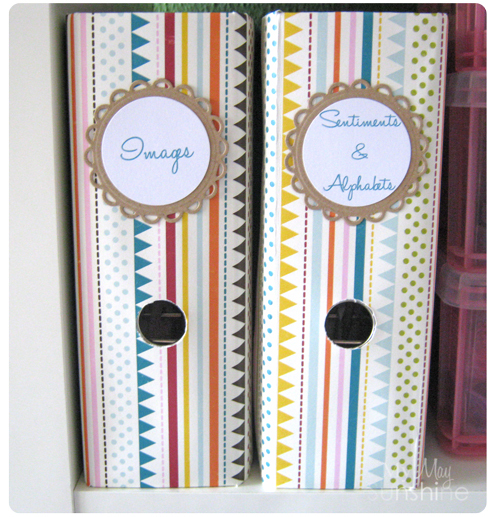 Cute organizational binders, I need a way to keep mine in order too. For now I've got them in a basket but since I have more space for vertical storage binders would be a much better solution for me. Love the paper you used to cover them. The binders looks so lovely! I love the embellishments! Love the binders up-jazzing!! Very sweet! 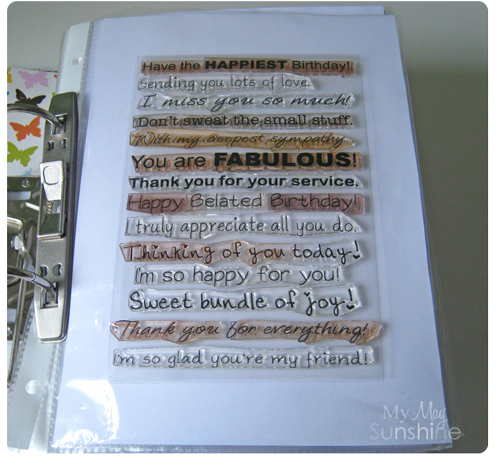 The stamps in the binders are on the acrylic sheets that they came on and then the acrylic sheets were taped to the card using double sided tape. The stamps in VHS cases are cling stamps so they just stick to the side of the case. Thanks. I used double sided tape to adhere the paper to the binder.